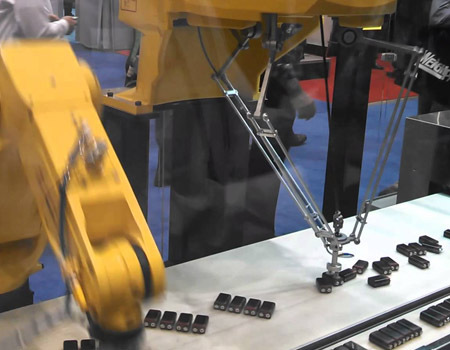 Picking & Packaging Automation | Pick and Place Robotics Integrator - JH Robotics, Inc.
High speed pick and place robotics are allowing companies in nearly every industry to remain competitive and lower manufacturing costs. Advancements in vision technologies allow for pin point accuracy as products are transferred from one location to another. By taking human hands out of the pick and place process, you’re ensured that your customers get a consistent, quality product each and every time while decreasing your production costs. Robotics can solve ergonomic issues with repetitive operator motions in picking and packaging applications. High speed pick and place robots offer a variety of configurations to offer flexibility in the production line. 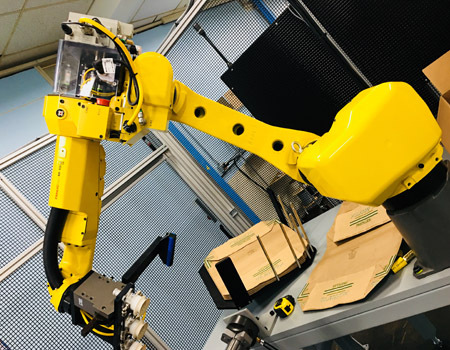 Robots can be mounted on a stand, mounted overhead and in a variety of other configurations to offer maximum working envelope and reduce the robots footprint in your facility. Once integrated, product will enter the work area after proper orientation has been determined by an upstream vision system. A customized end-of-arm tool will work quickly to move product into another process or pack a carton for shipping. During the pick and place process, other automation systems can be integrated such as labeling or pass/fail inspections. Where are Pick and Place Robots Integrated? Inspection and Quality Stations – Robots can use vision systems to visually inspect items before continuing to an upstream process on a fast moving conveyor belt. Quick Assembly – In a matter of seconds pick and place robots can pick up a piece from one conveyor, perform an assembly operation, and place the part on another conveyor with high precision. Quick Sorting – parts of various shapes and sizes can be rapidly determined through a vision system and automatically sorted for upstream applications. Rapid Packaging – Vision systems can identify parts as they move down a high speed conveyor, determine orientation and communicate with a pick and place robot that picks up the part and places it into packaging accurately and consistently. Our team of engineers, designers and integrators have the experience to successfully integrate pick and place robots into your manufacturing or production process. With over 30 years of experience in the robotics industry we’ve become the experts that manufactures rely on when it comes to automation. Call us today at 607-729-3758 or visit our online estimate form to get started on making your company more productive, more profitable, and running lean.